The executive board of Venice Events Academy, the new Academy of Show Business of Venice, held a special meeting today for the enthroning of singer Grace Jones as its International Honorary President. During its first plenary meeting the Board chose the winners of the 2012 Awards: Venetian Bruno Tosi, undisputed personality in the opera field and key figure of Venice’s cultural life as well as Ibizan performer Baby Marcelo. The council of the Academy assembled today in its base, Palazzo Donà delle Rose, in Venice’s sestiere Cannaregio. 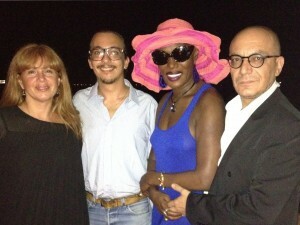 It’s been the first official meeting for singer Grace Jones, who chose Venice this year to spend her summer holidays. Accepting the honorary presidence of Venice Events Academy from the hands of the founders she declared: “The honorary presidence of Venice Events Academy seals my emotional tie with the city of Venice and its inhabitants, its ancient history and the beauty of these islands which are every day in my heart. I would like to offer my contribution of ideas and experience in order to enhance the talent of young people in the field of music, chant, acting and communication who will choose Venice and the innovative Venice Events Academy to improve their talents”. Grace Jones has been many times a guest of Venetian nights. She received the Cavalchina Award on the stage of “La Fenice” theatre during Carnival 2010, where she reached the stage on a white gondola. The Venice Events Academy Award 2012 has been assigned to Baby Marcelo, an icon of Ibiza’s nightlife and of the the world’s most famous clubs: a tenor, polyphonic and gregorian chant expert, he studied pantomime and contemporary dance with Lindsay Kemp and followed Japanese Buto dance courses. Performer and actor, he acted under the direction of Franco Zeffirelli, Mauro Bolognini and worked in the tours of music celebrities like Kylie Minogue. The Venice Events Academy Career Award 2012 was assigned to Bruno Tosi, an important figure of Venetian culture: a journalist, press agent of opera and classical music myths like Renata Tebaldi and Uto Ughi. Creator of the “Una vita nella musica” award, Tosi brought to the Laguna some of the greatest soloists and conductors, from Rubinstein to Barenboim, from Bernstein to Rostropovich. Founder of the Maria Callas Association of whom he was a close friend, Bruno Tosi has been the cultivated director of many open-air events of Venice’s Carnival, together with Maurizio Scaparro. His travelling exhibition with dresses, jewelry and memorabilia about Callas has been highly acclaimed all over the world, always receiving unanimous appreciation from the public as well as from critics. A multilingual platform will give the possibility to organize courses for foreign students who will be able to follow the theoretical lessons even in streaming, from any place in the world. These lessons will be supplied with written lecture notes and tests, in order to make the students pass to the next level only after the acquiring of new competence. A part of the live lessons and laboratories will be held in Venice. Students will be divided in groups according to the chosen subjects and they will work individually with the teachers. Both remote as well as the live lessons will be held in Italian, English and German by creatives and professionals of the communications, fashion and show-business fields who work on an international basis. The coordination of courses will be held by Katia Ferri Melzi d’Eril, journalist and novelist, Business Communication and Fashion Communication lecturer in Pavia University.